What you see above could almost be called revelation. M ‘s latest M5 is getting back to basics with an almost fully exposed engine under it ‘s hood. And while it ‘s not the entire engine, BMW is showing off a good percentage of the M5 ‘s mill for the first time since the E34 M5. In fact it ‘s been 15 years since we ‘ve been able to actually see any details of the M5 ‘s engine at all. But why is this? BMW has a history of shrouding some of the best engines in the world with copious amounts of black meaningless plastic. Whether it ‘s in the name of design, marketing or simply sound-proofing we here at BF have long disapproved. And there ‘s no better example of this than the last two generations of the M5. But things didn ‘t start out like that. Behold the glorious M88/3 engine (the US version was known as the S38B35) with it ‘s internals fully exposed and ready for work. It was perhaps the most pure M engine ever directly derived from the very powertrain that started it all in the M1. Things didn ‘t change much with the E34 M5 which featured an improved version of the venerable M88 now known as the S38B36. Once again BMW was proud to show off every detail of the powerplant. And why not? M5 ‘s were defined by their engines and the S38B36 was BMW at it ‘s best. Then came the E39. Arguably the best M5 of all time (notwithstanding the F10M which we haven ‘t driven yet). Everything about the car was an improvement. With one glaring exception: the cheap piece of black plastic hiding the magical 4.9L S63 engine. Finally we come to the recently departed S85 V10 form the E60 M5. It ‘s a monster of an engine with 10 individual electronically controlled throttles and a redline of 8250. And yet we couldn ‘t see a damn thing other than some plastic and an M badge. 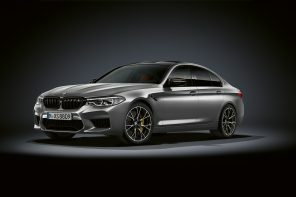 The F10M has the makings of an incredible car. 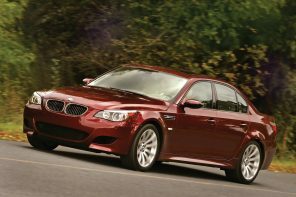 Much like the E39 M5 we expect it to be exceptionally flexible (torque-a-plenty) while being incredibly fast. And the engine responsible for all it? Yes you can actually lift the hood and see the plumbing for the first time in over 15 years. Thank you M.
Uh, correct me if I am wrong, but on the E39 and E60 M5’s, those aren’t just plastic shrouds to hide the engine, they’re a functional part of the air intake. Now, on the F10 M5, that’s a plastic shroud to cover things. It looks like it’s sitting directly over the turbos, so my guess it’s there as a heat shield to protect the hood since the hood and turbos are much closer on the M5 than on the X5/X6 M. Either way, on the other two they actually do something engine-related. Yes that’s correct – the engine covers were a functional part of the cooling system on both. And they look terrible doing it. But they’re every bit as functional as the intake you see on the E34 and E28. i hate engine covers as much as you. however, i think your argument here is flawed. the intake manifolds of the S63 and S85s are not, “black meaningless plastic.” being V8s and V10s, the only place BMW could have put them was on top – there was no room in the engine bay for any other location. they’re made of black plastic, yes, but their purpose was not to “hide” anything. they’re an integral part of the engine. One simple addition I would have loved to see is a return to the iconic “BMW M Power” script on the engine. um…this was a dumb article…rare for this site. i mean there isn’t really much more “engine” exposed in the new one vs. the past two models…all you are seeing more of in the intake and the turbos…engine is still largely buried under the shroud…likely to protect what is underneath and emphasize the M brand a bit. plastic doesn’t bother me at all…all i care about is how the thing pulls through the corners. I hate the covers too! But really, most buyers at this price point never really use all the cars performance potential, and they really like the “stuff” that says that they bought the best there is to be had. Also, as the plumbing and electronics get more and more complicated, there are tons of wires and hoses that need to be routed. While the covers are sometimes pointless, they do result in a cleaner look under the hood. But I’ve got to take exception to one of the phrases used above: “Behold the glorious M88/3 engine with all it’s internal exposed….” The only time an engine internals are exposed is during construction, rebuild or when a con rod or something like that punches a hole in the block. One should never see the pistons, crank, valves, con-rods, camshaft etc when looking under the hood. I had a conversation with Reeves Calloway about stuff like this. He shares the view expressed by many here: Adding stuff to make a car look faster/more powerful/etc is just a waste of time and money. Engineer to perform, and the looks of performance come for free! (Just think of how beautifully the pipes in some race car headers flow together, or the lines of a truly aerodynamic shape.) Sad thing is, cars aren’t just for performance. They are for image, branding, comfort etc. Stupid engine covers are just part of that. Kind of silly, and the S62 V8 intake plenum was only plastic for one year, they are metal on the later years. Far from “black meaningless plastic” …its functional and in my and many other people’s opinions it looks good.